We already know there are many health benefits attributed to Omega 3 and that Krill Oil is far more potent than Fish Oil. In fact Krill Oil is now regularly consumed by NASA astronauts because of the health benefits from this extremely rich source of Omega-3 fatty acids. Boosts Brain Power in Children – Omega-3 supplements have numerous trials have shown that they can improve behaviour and learning of children with ADHD and learning disabilities. More recently Dr Alex Richardson at Oxford’s Centre for Evidenced Based Intervention, studied under-performing children aged seven to nine. After taking daily supplements for 16 weeks their behaviour and reading improved. Preventing a Heart Attack – Omega 3s are known to reduce the inflammation of arteries which can lead to heart attacks, as well as being an anti-coagulant that can improve blood flow. There is also evidence that they can help in normalising irregular heart rhythms, says Tom Sanders, professor of nutrition and dietetics at Kings College London. Improving Your Memory – A study published in the journal Neurology earlier this year found that a diet rich in Omega-3s can increase volume of the part of the brain responsible for memory and protect against dementia. Omega-3s are also believed to reduce the formation of plaque in the brain, which has been linked to Alzheimers. Why the Eyes Must Have It – Experiments carried out at Harvard University demonstrated that mice fed a diet high in Omega-3s were less likely to suffer retinal bleeding – the trigger for many cases of age related macular degeneration, the leading cause of blindness in the elderly. It may help protect against dry eye syndrome too. Aids Stiff Joints – The anti-inflammatory properties of Omega-3s have been shown to benefit those with rheumatoid arthritis, which causes joint pain and swelling in the joints. High doses over several months are usually needed. Milder joint inflammation is much more common, and this can be reduced by ensuring a good intake of fish and seafood. 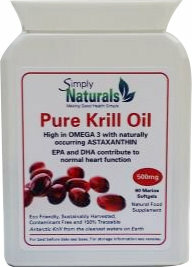 I personally like to increase my Omega-3s intake further by taking 4 Simply Krill Oil per day. I also prefer Simply Krill Oil over Fish Oil or other supplements because I know it comes from the purest source as I worry about modern day toxins and pollutants being dumped in the sea. Order Your Krill and Sizzling Minerals right here!